If you're like the many folks across the globe, you're up to see coverage of Prince William and Kate Middleton as they say their vows. The royal wedding has enamored so many people, and has been a hot topic of debate around the Internet. Some are happy to see the happy couple tie the knot. Unlike the way things were with Will's parents, the young couple seem to have a solid relationship built firmly on love. It's refreshing to see something positive in the news for a change. And, not only is it refreshing to see the young couple in love, Kate's story is a fan favorite. A "commoner," Kate has achieved a dream many young women crave: She found her prince and is becoming a princess. For the romantics out there, it's the perfect real-life fairytale. Of course, others are sick of hearing about a wedding among royals in a country that isn't their home. And, let's face it... royal wedding coverage has been pretty much nonstop for a while now. If you're reading this, you're probably not in the last group. I figured for you royal wedding fans I'd give you the chance to find all the news you need while you're drinking tea and waiting to find out who designed Kate's dress. Click here for links to royal wedding coverage at www.News-Herald.com. Now, pass me a scone. I saw the preview for "Win Win" when I went to "Kill the Irishman" and knew I would need to see the indie comedy with Paul Giamatti. Giamatti is Mike, a struggling lawyer and high school wrestling coach who ends up caring for his client's grandson, Kyle (Alex Shaffer), who turns out to be a pretty great wrestler. Mike hasn't been exactly honest in his business with Kyle's grandfather, and that turns out to be a problem when Kyle's mother gets out of rehab and learns what's going on. I knew that the movie would be a comedy with some drama, but I was prepared for it to be much more dramatic than it was. I never trust those indie comedies to actually be comedies. Let's be clear: This is not your Vince Vaughn, one-liner, laugh-a-minute comedy. But there are some funny parts, some laugh out loud moments. The movie was well-casted. Giamatti does well in everything he does, and his stressed-out, small-town lawyer was no exception. Amy Ryan (who I know best as Holly from "The Office") was great as his supporting but occasionally exasperated wife, and perfect as a mother who is protective over her kids and others. Shaffer was great in his film debut. He was the typical high school kid -- someone who is just along for the ride but incredibly passionate about a few things, including wrestling. Shaffer reminded me of several people I knew in high school, who looked like they were out for trouble but were really good, smart, talented students struggling to find their niche -- and excelling when they did. Click here to read The Associated Press review of "Win Win." Memorable movie scenes: Can you handle it? While winding down following a big Easter dinner, I happened across "A Few Good Men" while channel surfing late in the afternoon. I tuned in about midway through the classic film starring Tom Cruise and Jack Nicholson. From that point on, I was in for the remainder. Why? No matter how many times I've seen the final courtroom scene with Cruise and Nicholson, it never gets old. Even my wife dropped everything to watch. 10. "Shawshank Redemption" - Andy Dufresene's escape from Shawshank prison is riveting, but the cinematography when he tears his shirt off in the rain signifying his freedom is film artwork at its finest. 9. "Star Wars" - Darth Vader's grand entrance on the big screen scared the you-know-what out of one 7-year-old. 8. "Field of Dreams" - Who would have thought catch between a father (John Kinsella) and son (Ray Kinsella) could be so emotional? 7. "E.T." - It's difficult to pick between the magical bike ride and E.T. 's and Elliott's goodbye, so let's lump them together. 6. "Empire Strikes Back" - Five words: "Luke, I am your father." 5. "Rocky II" - Rocky beats Apollo to 10, wins the belt. Goosebumps. 4. "King Kong" - Kong's last stand atop the Empire State Building might be the most iconic in film history. 3. "Jaws" - "You're gonna need a bigger boat" needs no explanation. 2. "Raiders of the Lost Ark" - The most exciting opening scene in movie history, and it's not even close. 1. "A Few Good Men" - "I want the truth! 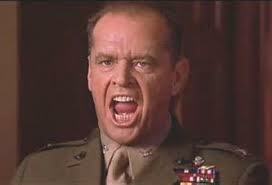 You can't handle the truth!" Another scene that needs no explanation. Honorable mention: "Saving Private Ryan" - Opening scene; "When Harry Met Sally" - Cafe scene; "Scarface" - "Say hello to my little friend" scene; "The Natural" - Roy Hobbs' final at-bat scene; "Rocky" - Training scene. "Rio" is on top for the second week in a row, and "Hop" is holding on to fourth place for Easter weekend. I was disappointed to see such a poor review for "Water for Elephants" (this week's No. 3), but the review I read in The Columbus Dispatch was much more kind to the movie, which I would like to see. I haven't seen any of the movies in this weekend's top 10, but this weekend I did see "Win Win", which I thought was pretty good (I'll probably blog about that later this week). 2. “Tyler Perry’s Madea’s Big Happy Family,” $25.8 million. Unfortunately, moviegoers are living in an era of reboots, remakes, re-whatever. The latest is Dudley Moore's "Arthur," in theaters now with Russell Brand in the lead. Sorry, but I won't bother. Instead, I might take in a viewing of "Top Gun." The '80s classic starring Tom Cruise will be re-released by AMC theaters on April 30 at 12:30 p.m. and on May 2 at 7 p.m. to signify its 25th anniversary. 10. "Raging Bull" (1980): The fights scenes between Jake LaMotta and Sugar Ray Robinson are visually stunning. 9. "Rocky" (1976): OK, it's a gritty-looking film, so this choice is sentimental. 8. "Citizen Kane" (1941): A film ahead of its time. 7. "Escape From New York" (1981): Two words, Snake ... Plissken. 6. "Back To The Future" (1985): Just a fun moviegoing experience. 5. "Aliens" (1986): The sequel to "Alien" is much more fast-paced and the final 45 minutes are awesome. 4. "The Natural" (1984): The cinematography for this baseball film is second to none. 3. "King Kong" (1933): Where else would we appreciate the Eighth Wonder of the World? The big screen, of course. 1. "Jaws" (1975): We will probably have to wait until 2025 for the 50th anniversary re-release to theaters. Let the countdown begin. I feel a bit like a broken record: Look! A kid-friendly movie topped the box office again. I'm undecided about seeing "Scream 4." I am a little terrified of scary movies, but I know the "Scream" franchise isn't supposed to be as scary (and definitely not as gory) as other horror flicks. A friend described it as a more smart type of scary movie. But I remember being pretty terrified of the first one ... so we'll see if I am up for catching up with the first three and watching the fourth. "Rio," on the other hand, is one I'd really like to see. Looking for some new music? 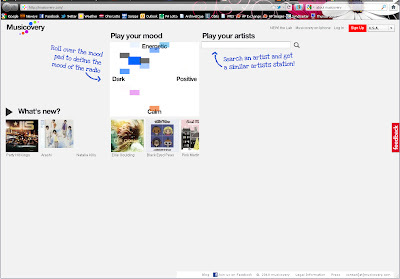 Try Musicovery! I know there is no shortage of websites out there that serve to introduce listeners to new music. Popular tools such as Pandora, Last.fm, the Ping tool on iTunes and others have been around for quite a while. And while I'm not dogging any of those (although I'll admit that I have absolutely no experience with Ping), I've found a fun new tool to use. Musicovery is an interactive tool, more of a toy, really, that allows audiophiles to explore music based on mood, style, artists and more. 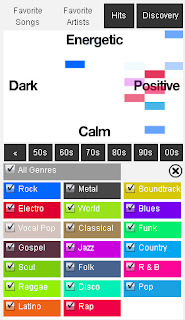 What makes Musicovery unique and fun is a color-coded map that shows you what you're listening to. Say you're in the mood for some dark, energetic 80s rock? 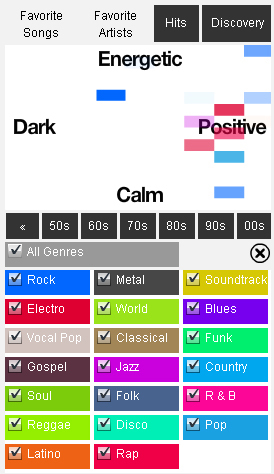 Well, you can indicate on a clickable graph just how energetic and dark you want your music. The squares you see light up and show a color based on where it falls on the graph. 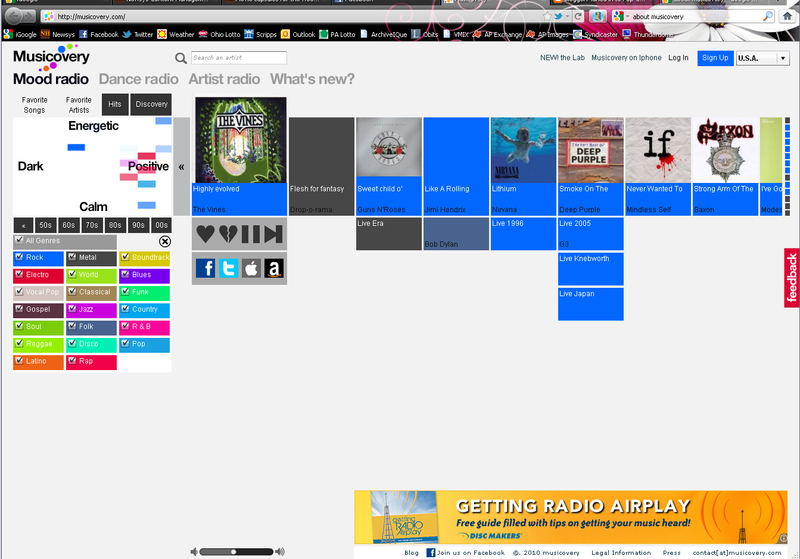 As you scroll over each square, a clip of a song fitting that style will play. You can narrow your choice down by finding a clip to suit your mood. Once you narrow down the mood you want, you are brought to the above screen where you will see the songs Musicovery has selected for you. From here you can narrow it down to different genres and years--for example, jazz from the 50s. You can also choose to hear hits--popular bands and songs most people will know--or discovery. If you unclick hits and choose just discovery, you're more likely to find an obscure band you can learn to love. As you listen to music, you have the option to "favorite" songs to come back to later, or search for the songs or artists on iTunes or Amazon. 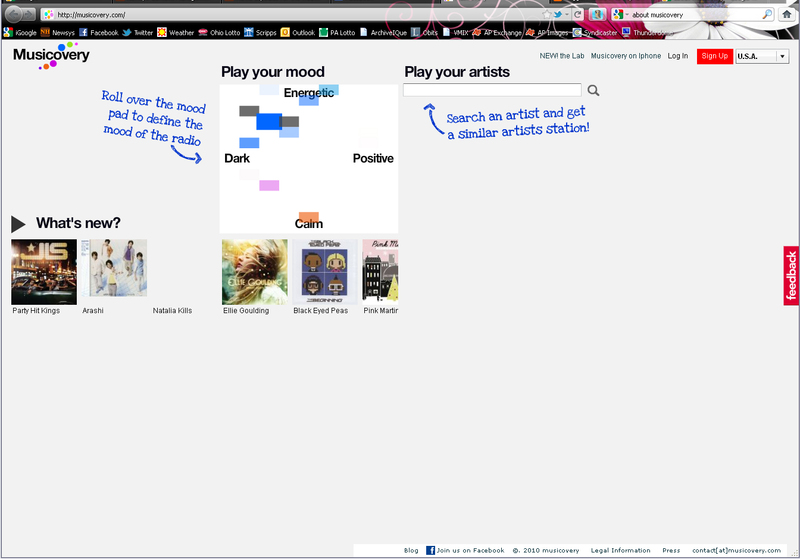 In essence, it's just another music searching site. What I like about it, really, is the colorful interface, the fun addition of searching by mood and the ability to narrow things down to find more obscure music you might not hear on Pandora. The service is free or subscription-based. I feel no need to subscribe to services like this, but I've read in other reviews of Musicovery that the music quality is better if you pay, which is to be expected. The trailer for the new film, "Rise of the Planet of the Apes" has hit the Web, and if you are a fan like me of the classic series of movies from the 1960s and 70s (forget Tim Burton's reboot), you have to be excited at first look. James Franco is the headline star, and the film's release date is Aug. 5. "Rise" is being touted as a prequel. What will be America's next great restaurant? "America's Next Great Restaurant" is NBC's competition reality show featuring four investors (chefs Bobby Flay, Curtis Stone and Lorena Garcia, and Chipotle founder Steve Ells) who have been given the task of selecting the perfect concept for -- you guessed it -- America's next great restaurant. The focus is on fast-casual eateries, otherwise known as fast food. Joseph Galluzzi, The Brooklyn Meatball Co.
Cheryl: I like food and going out to eat, so I like the idea of this show. I've liked several of the restaurant concepts, and I've agreed with the judges on pretty much all of the decisions. What I don't like is the seemingly strict time limits on each of their challenges. I understand needing to make split-second business decisions, and needing to work quickly in a fast-casual restaurant environment, but I think that kind of stuff improves over time after the concept and recipes are well fleshed out. Danielle: It's been a lot of fun to watch the as contestants go from having a pipe-dream-esque idea to something that could actually work as a restaurant. We get to see contestants develop menu ideas and crew uniform concepts, work with graphic designers on signage and logos, and then try to put them in action in front of test groups and the judges. "You will not be opening America's next great restaurant"
Cheryl: I would like to see restaurants selling wraps, fusion tacos and customized stir fry, but I'm not surprised any of those contestants didn't make it through. The menus were intriguing and different, but the contestants struggled to develop their restaurants into working models. A good restaurant is a lot more than good food. Danielle: While Cheryl and I both liked some of the concepts that have been eliminated, it was easy to see why they were chosen. Each week we seem to easily guess which concepts will be on the chopping block next. We watched as Saucy Balls turned into the Brooklyn Meatball Co. as his name and imagery was deemed borderline inappropriate and a bit campy. I guess it's been interesting to see this perspective since I haven't really thought about all the ins and outs of the restaurant business before. Cheryl: I'm happy with the top five. I'm impressed at the comeback by Grill'Billies, which seemed to be headed home four weeks ago. I would call Grill'Billies the front-runners now (and I'd love to try some of their cherry cola pulled pork). I'd also really like to try the meatballs (his Italian grandmother's recipe!) and Indian food. I could take or leave the soul food (not exactly my thing, though I'm tempted by the chicken and waffles) or Mediterranean cuisine (even though it's probably the healthiest option). Who gets eliminated next week really depends on who fails the challenge. The meatballs restaurateur needs to kick it up a notch because I don't know if his great food will help him keep his head above water. Danielle: Cheryl and I are in agreement. I saw Grill'Billies leaving early, but they have made a stellar comeback. As we saw in last week's challenge when the restaurateurs were tasked with operating food trucks in downtown LA, the Grill'Billies team seems to lack some business sense (actually, most of the contestants did, evidenced by most of them not knowing how much it cost to produce each meal, and no contestant was profitable in the challenge). I also think Joey, of Brooklyn Meatball Co., is one of the weakest. Cheryl: Grill'Billies or Spice Coast. The Grill'Billies concept seems like it would work really well across the U.S., but Spice Coast is so different from the usual fast food fare. The investors sure have a tough and tasty choice to make. Danielle: Sudhir of Spice Coast seems to have his head together the most. His food has won over many contestants and the judges, and he has consistently shown fairly good decision making skills. Next week's challenge is feeding children, so he could suffer there--I'm not entirely sure Indian cuisine will win kids' hearts. Grill'Billies probably has the most universal appeal, but I imagine meatballs would have quite a bit as well. Still, my head and my heart are saying it will be down to Spice Coast and Grill'Billies. I think I'd like to see Spice Coast win because it would be so different from what is currently available, but big part of me is thinking Grill'Billies is going to pull off the win. If I say the names Woodhouse, Sterling Mallory Archer and the Wee Baby Seamus, do they mean anything to you? That's a shame. A travesty, really. That means you're not watching the best show on TV, FX's "Archer." 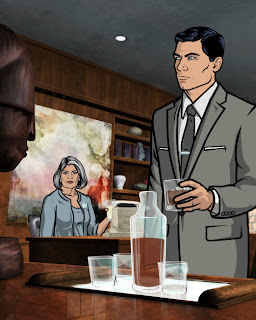 The animated series about a boozing, womanizing, smart-mouthed super spy, Sterling Archer (voiced by the brilliant H. Jon Benjamin, also the voice of the lead character on Fox's solid "Bob's Burgers"), and the agency for which he works is a weekly 30-minute helping of bliss. Sure, "Archer" isn't for everyone. First, you must have a sense of humor. Second, you have be cool with four-letter words and what is at times incredibly crude -- if brilliant -- material. This cartoon ain't for the kiddies, folks. But I don't throw the "best show on TV" title out their lightly. "Archer" is fantastic. The worst episodes are better than almost everything else on your hundreds of cable stations and broadcast networks. OK, maybe "best" should be replaced with "most enjoyable." "Archer" isn't "Breaking Bad" or a handful of other hour-long dramas where the greatest work in television is being done. And it sure isn't trying to be. There are but two episodes of the brilliant second season left, Thursday at 10 p.m. and the same time the following week. I urge you to watch. I beg you to rent the first season on DVD. If you do, you're bound to be there with me when "Archer" returns for its third season. (Thank you, FX, for renewing it). Visit the official "Archer" site here. April 28 will be a sad day at Dunder-Mifflin's Scranton, Pa., office -- and throughout the rest of the country. Michael Scott will bid farewell to "The Office" as Steve Carell leaves the NBC comedy. NBC is confirming April 28 as the date for Steve Carell’s final appearance on “The Office.” His farewell episode on the popular comedy will be supersized, the network announced Monday. That night’s long goodbye will air from 9 to 9:50 p.m. Eastern time, followed by an extended version of “Parks and Recreation” that concludes at 10:30 p.m. Eastern, NBC said. It will be weird to see "The Office" without Carell. On one hand, I think it's good that the bumbling Michael Scott won't be over-staying his welcome. But on the other hand, I can't imagine how successful the show will be without such a key character. "The Office" is full of plenty of laugh-inducing misfits, so the removal of their office leader will certainly change the dynamic. Will Ferrell will be joining the cast for a short storyline, but I don't think NBC will make him the new manager of Dunder-Mifflin's Scranton operations. I think the new Michael Scott would need to have a not-Michael Scott personality -- or at least the new character's ineptitude will need to be manifested in a different way. Will Carell's departure mean "The Office" is going to jump the shark? We'll probably have to wait until next season to find out. For now, I'm going to prepare for what will likely be both a laugh- and tear-inducing goodbye. Even though Sports Editor Mark Podolski had a less than enjoyable experience at "Hop" with his 2-year-old son, that film still easily took the No. 1 spot at the weekend box office. I'm a bit surprised that "Hop" did so much better than all of this weekend's new releases, but as I said before, kids movies generally do well, no matter how good they actually are. 9. “Diary of a Wimpy Kid: Rodrick Rules,” $4.9 million. Fans of FX's venture into the seedy world of boxing, "Lights Out," had to be disappointed when the network showed its final episode of the drama this week. 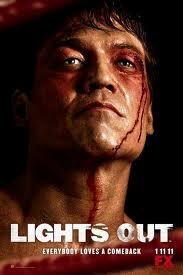 "Lights Out" lasted just one season, but the finale was awesome. Former heavyweight champion Patrick "Lights" Leary reclaimed his belt by knocking out the reigning champ "Death Row" Reynolds, a scene that had me pumping my fist, and hooping and hollering. Actor Holt McCallany, who played Leary, deserved a better fate than what FX threw at him. McCallany is talented and will land on his feet. The actor carried the show, and showed great presence as an actor and as a boxer in the ring. I wonder what FX could have done with a second season of "Lights Out" since the ending of the only season was so stunning. Moments after winning the heavyweight title, Leary is preparing himself for his news conference and his new life as the champ, or so we think. He appears disoriented and lost in the corridor of the arena before his wife tracks him down to take Leary to talk to the media. A punchy Leary, however, is the one asking a question. "Who won the fight?" Leary asks his startled wife. Talk about a punch to the gut no one saw coming. The dementia mentioned earlier in the season has caught up with "Lights," so the question is, did he really win? Yes, he won the fight, but at what price? We'll never know. That was it. End of story. End of "Lights Out." Here is the newest trailer for "Green Lantern," which will be released in June. It looks awesome. See for yourself. Sunday marked a fun day for my family as my wife and I took our 2-year-old son, Samson, to his first visit to the movie theater. We saw the Easter bunny movie, "Hop." Here's a breakdown of our day. Noon: I ask Sam if he's excited. "Go to movie, daddy," he said. 12:30 (as my wife drags to get ready): "Daddddy, go to movieee!!!" 1:05: We're settled in our seats. Sam: "Want popcorn." 1:10: Sam has his popcorn, and he's munching away. 1:20: Sam takes his shoes and socks off and lounges back in his seat. The king is in full relax mode. 130: Sam: "Go home, go play." 1:40: Sam begins throwing popcorn at mom, who is not pleased. I think Sam woke her up. 2:05: Popcorn is flying everywhere, except in Sam's mouth. 2:11: Sam throws his sippy cup into the row in front of us. Daddy's cell phone becomes a flash light while searching for said cup. 2:15: Sam begins swimming in popcorn on the ground. My wife and I look at each. "Bath tonight." 2:25: Sam begins talking really loud. 2:35: The film's climatic scene has the audience riveted (well, maybe some of the children in theater). Sam really doesn't seem all that thrilled. 2:40: The movie's over and I ask Sam if he liked it. "Like bunnies. Like chickens." By the way, "Hop" is awful, but your kids will love it. Cleveland walked away with the championship in the biggest event of the year on Sunday night. A Clevelander, anyway. OK, Parma. Still, there was something satisfying about hearing the ring announcer at WrestleMania XXVII say "from Cleveland, Ohio" while introducing WWE champion Mike "The Miz" Mizanin. He left the ring at the end of the night as the champion, too, defeating the previously unbeatable challenger John Cena. Aside from the hometown pride, it wasn't one of the best WrestleManias. If you were the one shelling out the $55, you probably found a couple things to like based on the cost. If you were watching for free, it felt like a movie you could have skipped until it came out on DVD. It starts with the end. The main event leaves the last taste, and this one felt like the end of a regular Monday night "Raw." When the match started, the crowd was already gassed after 3 1/2 hours of action. Plus, the Rock was certain to intervene at some point. So the fans were quiet while the Miz and Cena battled, basically waiting for the Rock to show up. The match ended in a double countout. Everyone knew the biggest show of the year wasn't going to end like that, so it was a matter of what WWE was going to do with the 10 minutes of air time it had remaining. The Rock came out, restarted the match, pummeled Cena with his Rock Bottom finisher, and Miz retained. It seemed anti-climactic and left a logic gap. As Internet critics pointed out, if the Rock had planned to take out Cena, why did he wait until after the countout? He didn't really make up his mind on the spot, did he? Fans were also wiped out for the main event because they gave it their all in the Triple H-Undertaker match. The two tried to tell a story, one of Triple H trying to finally put Undertaker away, but Undertaker always coming out on top at WrestleMania. Undertaker won in the end with his Hell's Gate finisher. It came after a series of chair shots and finishing moves by Triple H failed to put Undertaker away. Unlike the Shawn Michaels matches the past two years, this one was less dramatic. You knew Undertaker was going to win, but they took so much time between moves that it didn't add suspense. They just took too long. Undertaker was taken off in a stretcher. Surely that won't be the last image we have of one of the all-time greats? Another match that took far too long was Michael Cole vs. Jerry Lawler. It could have been a straight-forward squash with Lawler getting his due against the dastardly Cole. But it went on and on and on before Lawler finally won. Then, inexplicably, the the RAW general manager reversed the decision and gave the victory to Cole, which means we'll be getting more annoying Cole commentary instead of the end of the feud. - World title: Edge defeated Alberto Del Rio. Oddly, this was the opening match. That says a lot about the Smackdown championship. The crowd was on fire. Turns out, they should have saved a little energy. - John Morrison, Trish Stratus and Snooki def. Dolph Ziggler and LayCool. The Sheamus-Daniel Bryan match was moved to before the show, and it was turned into a battle royal, won the by the Great Khali. Another family-friendly movie opens at No. 1 -- and how! The ticket sales for "Hop" more than doubled that of "Source Code." I think I'd like to see both: One stars an adorable bunny, and one stars a dreamy Jake Gyllenhaal. 4. “Diary of a Wimpy Kid: Rodrick Rules,” $10.2 million. For its last big push before WrestleMania XXVII, WWE put two of its biggest stars in the ring during “Raw” on Monday night. At the end of the show, John Cena and the Rock went face to face to hype Sunday's pay-per-view card, the biggest of the year for the company. It was the Attitude Era vs. the current PG brand. It also highlighted the trouble WWE has had in the transition between the two. It wasn't until the Miz joined Cena and the Rock that the two participants in the WrestleMania main event were in the ring together. The biggest championship match of the year is the Miz (Parma native Mike Mizanin) defending against Cena. The Rock isn't wrestling on Sunday. He was brought in as the host. WWE needed star power to sell the show, so they inserted the Rock into the main event storyline, even though he won't be in the ring unless he interferes (that never happens). The deal to bring in the Rock was necessary because departures and hiatuses have thinned the ranks at the top of the card. Shawn Michaels retired. Batista left right behind him. Triple H took a year off, and Chris Jericho is on "Dancing With the Stars." - The Miz: He's held the WWE title for four months and has shown promise not only because of his on-camera work, but also because he's been proficient representing the company on the promotional circuit. But he's also been third fiddle to the Rock and Cena in the lead-in to WrestleMania, even though he's the one Cena should be most concerned with. - Sheamus: The Irish import has had two WWE title reigns totaling five months. - Dolph Ziggler (Nic Nemeth of St. Edward High and Kent State wrestling fame): He was world champion for one day. - Jack Swagger: World champion for 2 1/2 months. - CM Punk: Three world title reigns totaling about five months. With the exception of Punk, who has been pushed as the leader of Nexus, none of the above has been on top long enough to be a singular draw on the Raw or Smackdown brands. Instead of a couple big-time threats, it's a bunch who have some cache, but not enough. A wrestler who doesn't even qualify for the above list is in the other main event on Sunday. Alberto Del Rio, a 21st century Million Dollar Man, fulfilled his self-professed destiny to be in the other WrestleMania main event by winning the Royal Rumble. He chose to face the current world champion, Edge. Because both are on Smackdown, WWE has had to put Del Rio into guest appearances on Raw just so fans can get familiar with him. Del Rio is the No. 1 contender for the world title, but until January he was "who?" to many who only watch the Monday night show. Del Rio's spot could have gone to Ziggler or another up-and-comer, John Morrison. Instead, they're stuck in a mixed tag team match with Snooki from "Jersey Shore." WWE also called in Trish Stratus from retirement to team with the trio. Stratus, along with the Rock, Steve Austin - who is the guest referee for the announcer battle of Jerry Lawler vs. Michael Cole - and Triple H are returning veterans added to boost the card. Triple H hasn't wrestled in almost a year, and he is trying to end Undertaker’s 18-match WrestleMania winning streak. Until Monday night, the reasons for Triple H’s motivation were oddly vague. It had something to do with being the last outlaw, without a mention of their match at WrestleMania 17. But in a great promo on “Raw,” Triple H explained that someone needed to tell Undertaker it was his turn to be put down, and he was the one to do it. Shawn Michaels was also involved in the exchange long enough to make fans wonder if he’ll be also get involved on Sunday. Michaels had his final match last year at Wrestlemania XXVI. Triple H, Undertaker or both could be in their last Showcase of the Immortals this year. It’s a WrestleMania of transition. If WWE does it right, it will only need the stars of 10 years ago for the Hall of Fame ceremony in 2012, not as participants in WrestleMania XXVIII. Big Show, Kane, Vladimir Kozlov and Santino Marella vs. Wade Barrett, Ezekiel Jackson, Heath Slater and Justin Gabriel.